Chances are that you’re already familiar with Stoke Park. 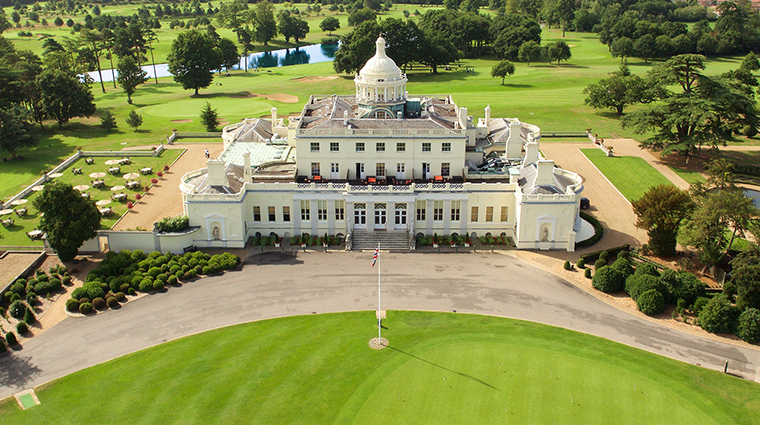 Its 27-hole championship golf course and 300 acres of parkland, located about 35 minutes outside of London, have appeared in a plethora of films over the years, from Goldfinger to Bridget Jones’s Diary. The 50,000-square-foot property dates from 1795 and was once the private home of the family who went on to found the state of Pennsylvania. It was here that the U.K.’s first ever country club was founded in 1908, and that tradition of service is still going strong today. • The Four-Star hotel’s enormous health pavilion boasts a 4,500-square-foot gym, hot yoga and spinning studios, and an indoor pool with floor-to-ceiling windows. • The tennis facilities are second to none, whether you’re a vacation player or a seasoned professional, and include three indoor courts, four manmade clay courts and six grass courts. A high-tech 3D visualization system is on hand for instant shot analysis. • Also on site is a spa with 11 treatment rooms, hair salon, nail bar and relaxation room. Entering the spa atrium is a calming experience, as the space is bathed in natural light filtered through a 15-foot tropical fish tank that looks out over the pool. 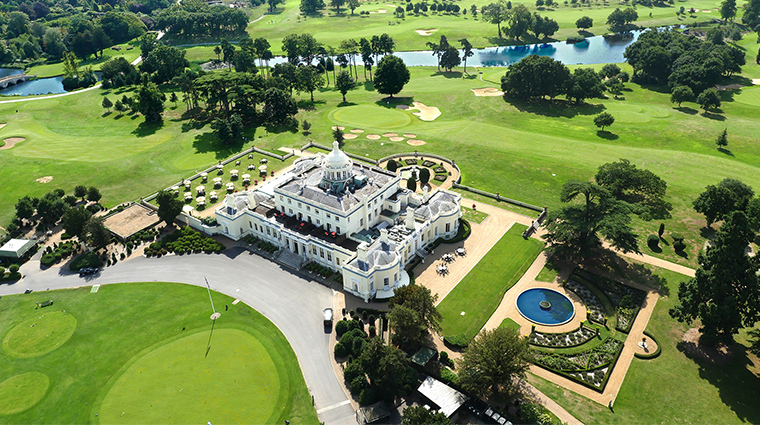 • A short jaunt across the pretty landscaped gardens is the first tee of the hotel’s golf course. 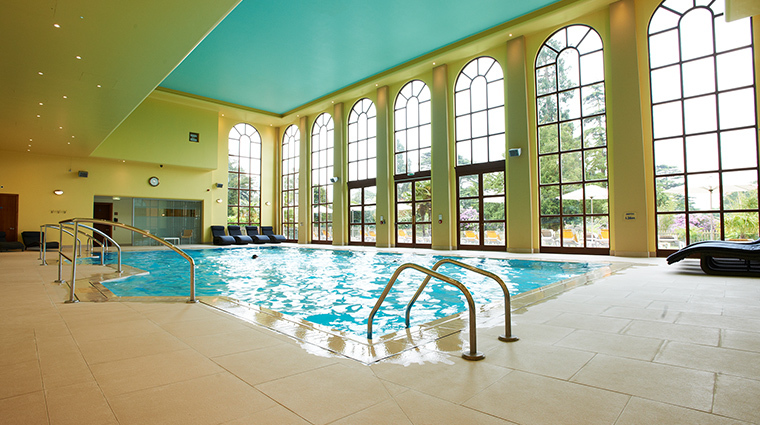 • Children aren’t forgotten at Stoke Park either, with kids’ fitness classes available, plus a nursery and a playroom for children eight and under. • Guests with a particular sporting pursuit in mind should choose accommodations accordingly — the Mansion is ideally situated near the golf course, putting green, swing studio and practice range, while the Pavilion offers unrivalled access to the tennis and spa facilities. • There are nine private rooms, perfect for hosting conferences and events. • As a popular wedding destination, this glamourous hotel staffs a wedding coordinator that will assist in planning the most exquisite celebration. 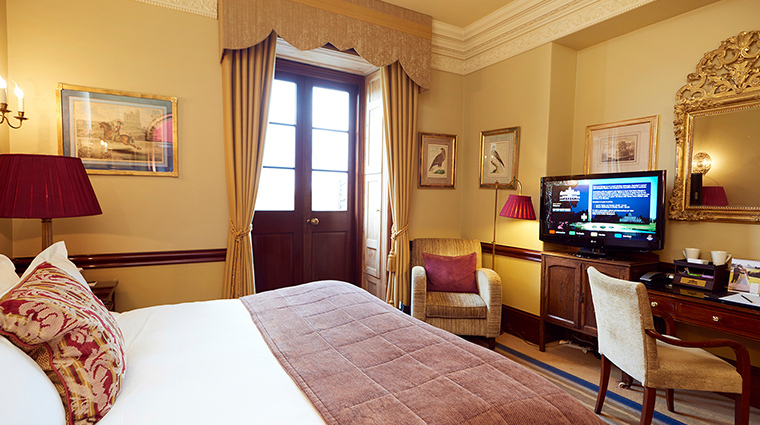 • Rooms are split between Stoke Park’s two buildings, the historic Mansion and the newer Pavilion. • All of the Mansion’s 21 rooms and suites have marble bathrooms, while those in each of the Pavilion’s 28 rooms have luxurious heated floors. 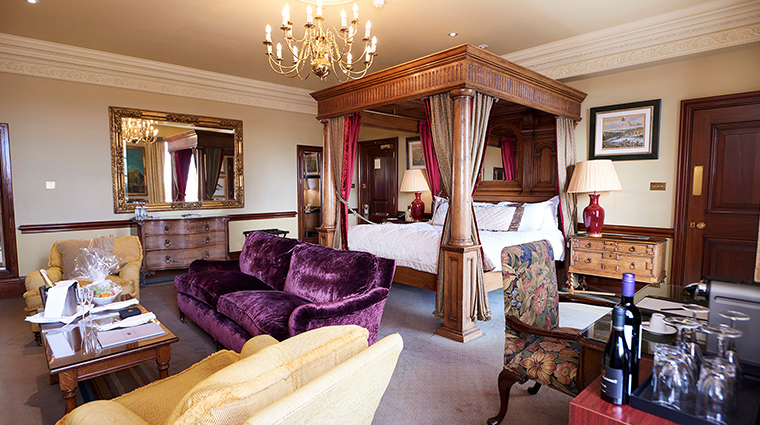 • Those seeking a traditional feel will love the open fireplaces and book-filled shelves in the Mansion, not to mention these rooms’ spectacular views of the estate. 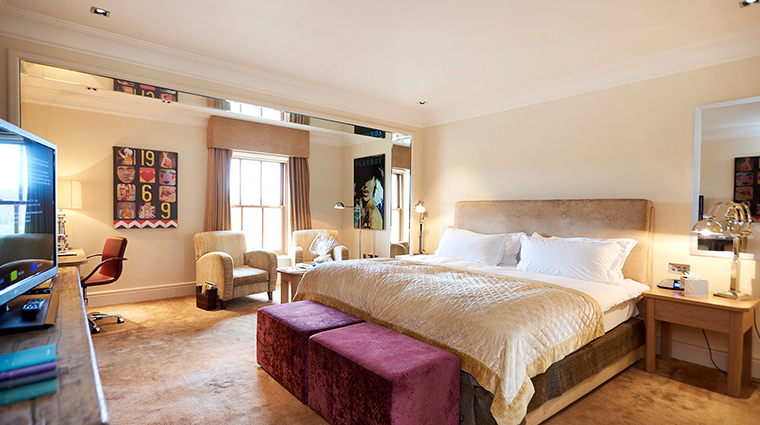 • Pavilion rooms have a more contemporary flavor and feature bold modern artwork. • Head chef Chris Wheeler learned from the masterful Jean Christophe Novelli before bringing his own unique take on modern British cuisine to Stoke Park’s fine dining restaurant Humphry’s. • Wheeler’s food is all about startling twists on classic dishes — a starter of Dorset crab will be served with a refreshing cucumber jelly and pink grapefruit salsa, or a saddle of venison will be accompanied by violet potatoes and salsify. 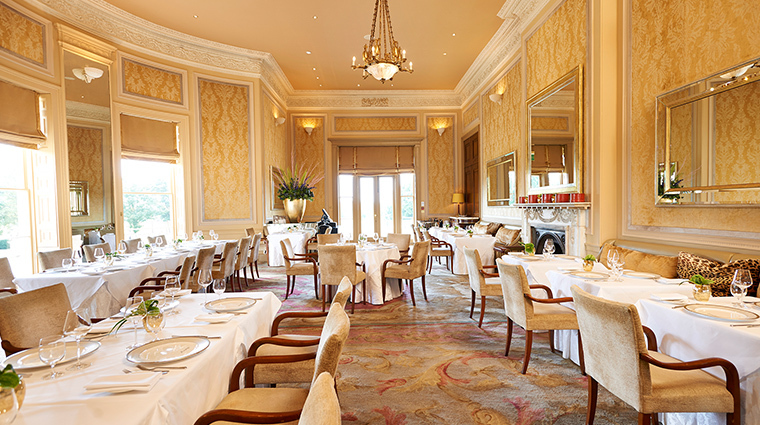 • The restaurant, named after the landscape architect Humphry Repton, overlooks the resort’s lovely south terrace, expansive grounds and lake (with a 18th-century bridge). 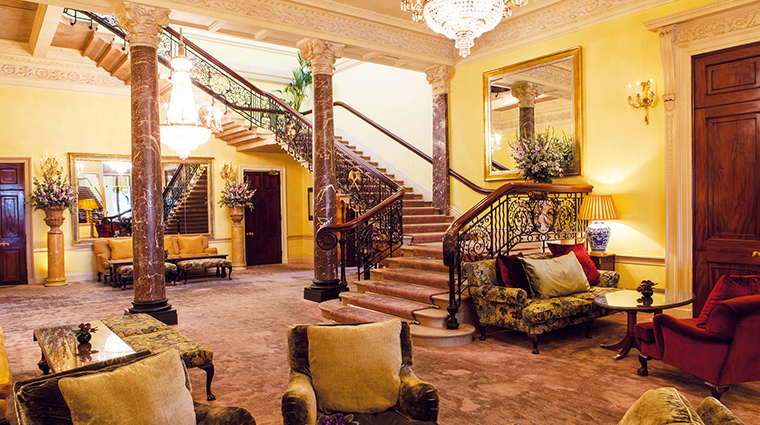 • Informal, all-day dining takes place in The Orangery — think classic pub-style dishes like steak and ale pudding and homemade sandwiches — and at San Marco, a relaxed Italian brassiere. • Both eateries also serve afternoon tea and have dedicated children’s menus.